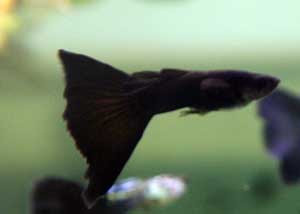 Black Moscow Guppy, as its name, is featuring full back color all around its part of body and fin. If you look carefully, the Black Moscow has 100% black color. Which makes this strain looks both beautiful and mysterious. Most of Black Moscow guppies’ sizes are varying from small to medium size. Be careful to breed this strain though, because many breeders tend to lose its full black color when they try breed to a larger body size. So, the proverb ‘Big is Beautiful’ is not needed when breeding this strain.